5 Junior Baseball Leagues of Junior High School Students (15U category) coordinated by Japan Amateur Baseball Association (JABA) decided to jointly introduce new pitching guidelines starting from 2014 season and for full implementation in 2015. 1. Each pitcher cannot pitch more than 7 innings a day and total of 10 innings in 2 consecutive days. A pitcher who pitched 2 games or more in a day, and a pitcher who pitched total of more than 5 innings in 2 consecutive days cannot pitch or play catcher on the following day. Fraction of an inning shall be counted as an inning in full. 2. Pitching full force in training shall not exceed 70 pitches per day and the total of 350 pitches a week. Pitcher shall not pitch full force for a day or more in a week. The initiative was greeted by the Bone and Joint Decade Japan (BJDJ), mostly comprising College Professors and Orthopedic Surgeons. Their Executive Board Meeting and General Meeting in Tokyo on Sunday, April 6, 2014 approved the plan to continue baseball coaches’ clinic in 2014 fiscal year (till March 2015) with the help of Japan Rubber Baseball Association (JRBA) and its local branches in many parts of Japan. JRBA, the largest baseball organization in Japan, has already pitch count rules for 15U players in place. The coaches’ clinic is dedicated to educate junior baseball coaches how to prevent growing baseball players of 15U from getting injured during their plays. BJDJ hosted 12 clinics in 2012 fiscal year to March, 2013 with the total attendance of 1,911 coaches and 8 meetings in 2013 (hampered by heavy snows) attended by 839 coaches for 8 sessions. 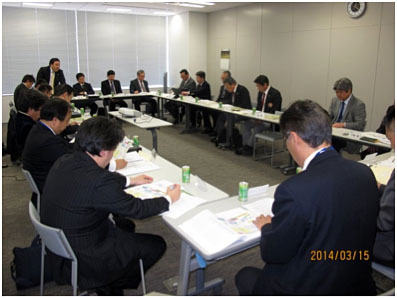 Earlier on March 15, 2014, Prevention of Sports Related Injuries for Growing Years Committee of BJDJ chaired by Dr. Kenji Takagishi of Gunma University held a session with the representative of junior baseball leagues jointly hosted JABA in Tokyo (photo). The Pitch count issue for junior players has drawn increasing attention since the 2012 Japanese National Invitational High School Tournament when a 16-year-old pitcher threw 772 pitches in a tournament by wining victories 3 complete games but lost the final game after retiring in 6th inning owing to fatigue.